What makes a great landscape painting? It’s not simply paint on canvas. Play of Light, Mystery, Passion, Composition, and Accurate Rendering. Those are the key ingredients for a masterful landscape painting. In this class you will learn exactly how these choice ingredients work. You will learn how to effectively utilize and combine them into a beautiful landscape. 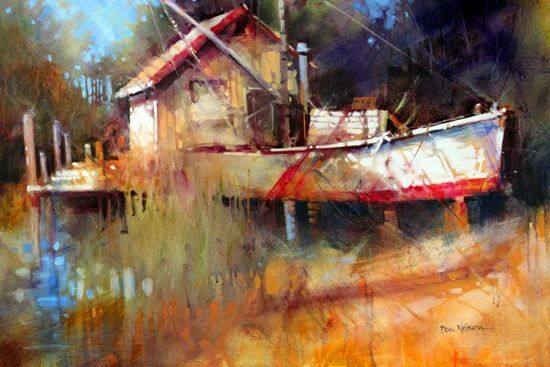 Don’t just paint a landscape; allow your art to transport your viewer to another place and time! Open for all skill levels, Dan’s comprehensive technique will enable the artist in you. Join us in making something spectacular! NOTE: Each artist in this class will paint in BOTH acrylics AND oils. Each student is requested to provide a full complement of EITHER oils or acrylics; Dan will provide the alternate supplies to each student. Note: The list of colors is merely a suggestion for those who have no idea what to bring. If you are an experienced painter, just bring your normal colors. OILS PAINTS: Any artist quality brand will do. Avoid Hues (H or “Imit”), except in yellow. OPTIONAL: Small re-sealable container cups like Ziploc or Glad -- about 8 oz. One for each color. An assortment of BRISTLE brushes, sizes 2 - 12. My favorites are Filberts. If you like you may add a few sable or synthetic filbert brushes-- Nothing smaller than a #2. For signing paintings, use a high-quality Winsor Newton Series 7-- size 1 or 2.